Stinger is a game published and developed by Konami, a console-only sequel to the original TwinBee and the second in the series. It is known in Japan as Moero TwinBee: Cinamon Hakasei wo Sukue! which translates to "Burn TwinBee: the Rescue of Dr. Cinamon". This is the first game in the TwinBee series that was released in the United States and Canada, released under the name Stinger, although the origins of this name are unknown. 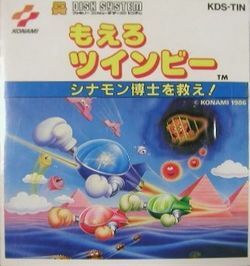 This game was originally released for the Famicom Disk System in 1986. It was ported to cartridge form with some elements removed for the North American NES one year later. At the end of the Famicom's life cycle (1993), a cartridge conversion of the original disk version was released in Japan. The Japanese version of the game (FDS or Famicom) allows up to three players to play simultaneously (with the third controller plugged using the Famicom Four-way Adaptor, the Famicom variant of the NES Four Score). In the American version this option was reduced to just two, with Winbee omitted. However, if you connect the Famicom cartridge version to a NES using a 60-to-72 pin adapter, you can use the NES Four Score to get a third player. Additionally, the original version contained two difficulty levels: Normal and Hard. In the NES version, this option is disabled, and the default difficult is Normal (though Hard can be accessed by finishing the game once). The Famicom cartridge version adds an Easy difficulty. In the original version, an enemy force kidnaps Dr. Cinnamon (creator of TwinBee and its siblings), and TwinBee, Winbee and Gwinbee, along with Skatch, Hoip and Merou, must rescue him. In the North American version, the story is basically the same, but Cinnamon's name was never mentioned and he is portrayed as a generic scientist. None of the three pilots are mentioned either. This page was last edited on 2 March 2016, at 02:06.